There’s a palpable new shift occurring in the mindset of cutting-edge business leaders today. In a world where rapidly changing dynamics is the new normal, and the unrelenting speed of technology is affecting everything that surrounds us, there is a clear realization of the fact that people’s skills and capabilities are not improving at the same pace. More than at any other time in our history, a leader’s ability to build and develop their talent bench is dependent on being ahead of the curve in anticipating change. They must ensure that their teams/organizations are skillfully ready to deal with the challenges and opportunities of change as well as the consequences in order to both survive and thrive. This new level of talent readiness is not a nice to have, it is a requirement to create competitive advantage and win in today’s global marketplace. Leadership performance coach Erica Peitler is at the forefront of these new skill and capability building requirements. She partners with business leaders to navigate this volatile, uncertain, chaotic and ambiguous world by first helping them to realistically diagnose their problems and opportunities. Then, she assists them with practical applications of leadership tools and language they can put on the ground within their unique organizations to facilitate solutions. The focus of her new book, Leadership Rigor, is on creating “change-ready leaders” who can successfully embrace today’s business growth challenges because they have the models and frameworks to assess, structure, and facilitate aligned actions across their organizations. These change-ready leaders also have the mindset and emotional skills to actively lean into the change process despite its uncomfortable nature. Peitler coaches leaders to be comfortable being uncomfortable and assists them and their teams in accepting that there is “nothing we cannot talk about” which creates a safe and open environment for cutting through to the heart of all business and people issues. At the end of the day, all leaders and organizations are driving for performance and productivity as their outputs. What Peitler believes she brings to the table for her clients is in getting them to have the conscious discipline to practice the critical skills that lead to their desired output. Without this, leaders are on a frustrating and emotionally draining treadmill not advancing their personal or professional progress let alone their teams and organizations. 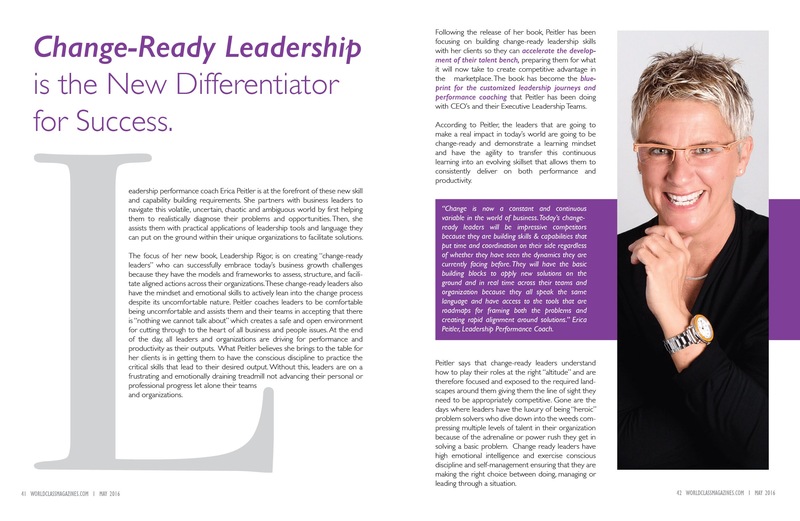 Following the release of her book, Peitler has been focusing on building change-ready leadership skills with her clients so they can accelerate the development of their talent bench, preparing them for what it will now take to create competitive advantage in the marketplace with their organizations. 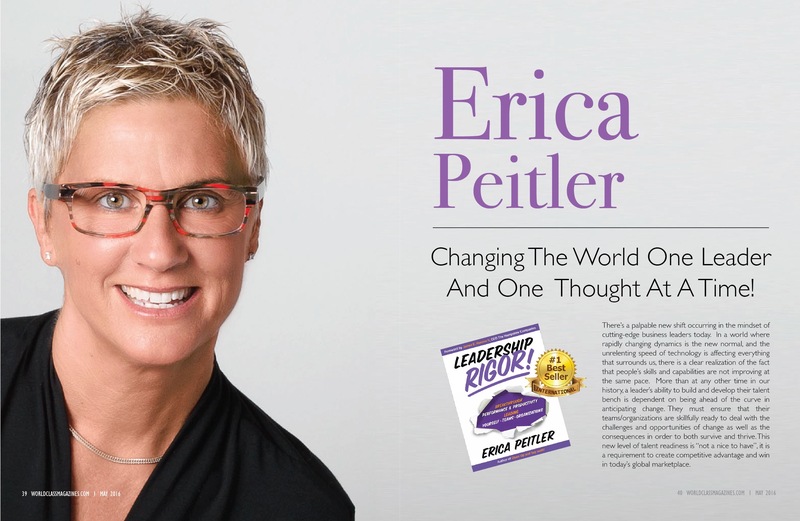 The book has become the blueprint for the customized leadership journeys and personalized performance coaching that Peitler has been doing with CEO’s and their Executive Leadership Teams. According to Peitler, the leaders that are going to make a real impact in today’s world are going to be change-ready leaders who demonstrate a learning mindset and have the agility to transfer this continuous learning into an evolving skillset that allows them to consistently deliver on both performance and productivity. Peitler says that change-ready leaders understand how to play their roles at the right “altitude” and are therefore focused and exposed to the required landscapes around them giving them the line of sight they need to be appropriately competitive. Gone are the days where leaders have the luxury of being “heroic” problem solvers who dive down into the weeds compressing multiple levels of talent in their organization because of the adrenaline or power rush they get in solving a basic problem. Change ready leaders have high emotional intelligence and exercise conscious discipline and self-management ensuring that they are making the right choice between doing, managing or leading through a situation. By more often selecting to manage and get work done through others vs. doing things themselves, the change-ready leader is creating bench strength below and around them by trusting their talent and investing time and energy in their hands on learning. This allows the Supervisor or Team Leader to invest their time scanning the internal/external environment to prioritize initiatives, allocate limited resources for highest returns and ensuring communication is constantly in place to let people know the company narrative of where were we, where are we now and where are we going. In getting the altitude right for themselves and others, change-ready leaders are facilitating both progress and aligned action; this is the differentiator today. Peitler’s perspective is that an organization that employs change ready leadership practices and principles are primed for success in the future. Peitler comes from the healthcare industry and sees a clear analogy between disease management and change management. Disease management today has evolved from late-in-the-game reactive treatments as the only solution to earlier intervention options and now more aggressively to preventive care possibilities. Establishing Change-Ready Leadership in your organization is creating your preventative health approach to ensure you are now able to proactively anticipate and make pre-emptive moves to seek, see and seize entry points for offensive or defensive moves rather than merely reacting to changing market dynamics or doing the best you can to mitigate changes already in process. Peitler believes that leadership development does not have to be a black box mystery where leaders never really know where they are in their learning curve or career progression. Rather, leadership development should be considered a journey with a transparent road map. She believes in the concept of learning to lead yourself before you advance into roles where you will be leading others, given that the skill sets required are quite different. Skillfully leading yourself, she says, is the foundation necessary to have the competence and confidence that it takes to “do and engage around the work.” You need to learn to be an effective team player. From managing your time, developing your leadership presence, building your voice and understanding how to have productive conflict and get your ideas across, all of these are the basic requirements for being a strong individual contributor. When leading at the team level, the game changes as you are now required to use interpersonal skills to get work done through other people. Peitler says for leaders to operate successfully on this level, they have to advance from simply applying their personal capabilities toward “doing” a job and now have a capacity for patience in developing capabilities in others. This will include being able to deal effectively with coaching different personalities, defining the “what” and letting go of the “how” so direct reports have the freedom to do the work in their own way, as well as cultivating your ability to trust and therefore not micromanage. You must appropriately demonstrate that you have confidence in the people you have put into place by developing their skills and then trusting them to deliver the results. Advancing into a leadership role at the organizational level requires yet another incremental set of skills. Most importantly, leaders must appreciate that how they play their role influences the environmental dynamics they establish as they shape the conditions for the performance and productivity for their enterprise. This is where understanding how to create Organizational Excellence comes in! 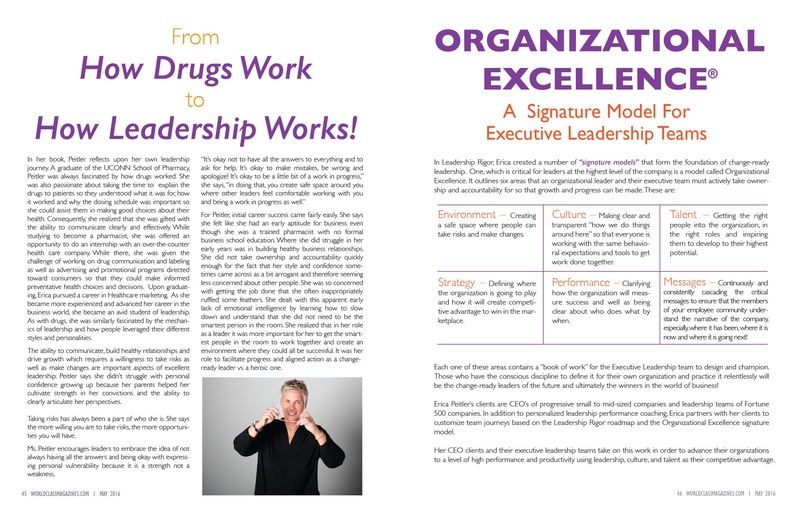 From How Drugs Work to How Leadership Works! 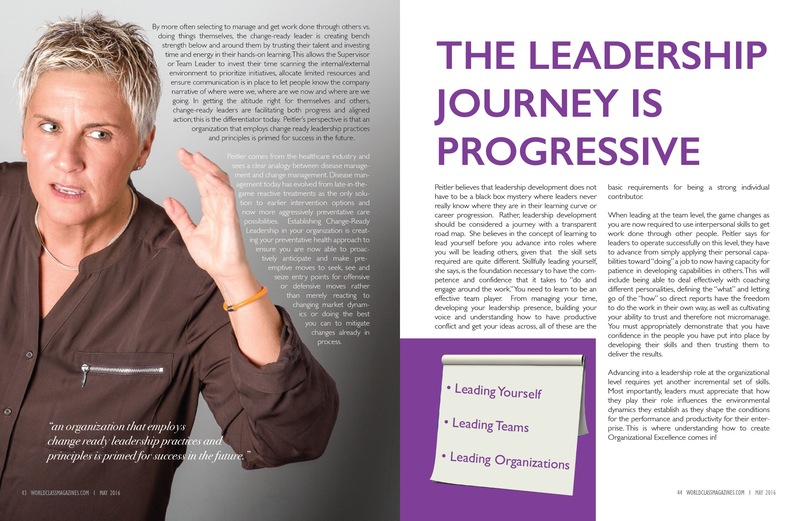 In her book, Peitler reflects upon her own leadership journey. A graduate of the UCONN School of Pharmacy, Peitler was always fascinated by how drugs worked. She was also passionate about taking the time to explain the drugs to patients so they understood what it was for, how it worked and why the dosing schedule was important so she could assist them in making good choices about their health. Consequently, she realized that she was gifted with the ability to communicate clearly and effectively. While studying to become a pharmacist, she was offered an opportunity to do an internship with an over-the-counter health care company. While there, she was given the challenge of working on drug communication and labeling as well as advertising and promotional programs directed toward consumers so that they could make informed preventative health choices and decisions. Upon graduating, Erica pursued a career in Healthcare marketing. As she became more experienced and advanced her career in the business world, she became an avid student of leadership. As with drugs, she was similarly fascinated by the mechanics of leadership and how people leveraged their different styles and personalities. The ability to communicate, build healthy relationships and drive growth which requires a willingness to take risks as well as make changes are important aspects of excellent leadership. Peitler says she didn’t struggle with personal confidence growing up because her parents helped her cultivate strength in her convictions and the ability to clearly articulate her perspectives. Taking risks has always been a part of who she is. She says the more willing you are to take risks, the more opportunities you will have. Ms. Peitler encourages leaders to embrace the idea of not always having all the answers and being okay with expressing personal vulnerability because it is strength not a weakness. For Peitler, initial career success came fairly easily. She says she felt like she had an early aptitude for business even though she was a trained pharmacist with no formal business school education. Where she did struggle in her early years was in building healthy business relationships. She did not take ownership and accountability quickly enough for the fact that her style and confidence sometimes came across as a bit arrogant and therefore seeming less concerned about other people. She was so concerned with getting the job done that she often inappropriately ruffled some feathers. She dealt with this apparent early lack of emotional intelligence by learning how to slow down and understand that she did not need to be the smartest person in the room. She realized that in her role as a leader it was more important for her to get the smartest people in the room to work together and create an environment where they could all be successful. It was her role to facilitate progress and aligned action as a change-ready leader vs. a heroic one. Environment – Creating a safe and spacious environment where people can take risks and make changes. Culture – Making clear and transparent “how we do things around here” so that everyone is working with the same behavioral expectations and tools to get work done together. Talent – Getting the right people into the organization, in the right roles and inspiring them to develop to their highest potential. Strategy – Defining where the organization is going to play and how it will create competitive advantage to win in the marketplace. Performance – Clarifying how the organization will measure success and well as being clear about who does what by when. Messages – Continuously and consistently cascading the critical messages to ensure that the members of your employee community understand the narrative of the company, especially, where it has been, where it is now and where it is going next! Each one of these areas contains a “book of work” for the Executive Leadership team to design and champion. Those who have the conscious discipline to define it for their own organization and practice it relentlessly will be the change-ready leaders of the future and ultimately the winners in the world of business! Erica Peitler’s clients are CEO’s of progressive small to mid-sized companies and leadership teams of Fortune 500 companies. In addition to personalized leadership performance coaching, Erica partners with her clients to customize team journeys based on the Leadership Rigor roadmap and the Organizational Excellence signature model. Her CEO clients and their executive leadership teams take on this work in order to advance their organizations to a level of high performance and productivity using leadership, culture, and talent as their competitive advantage.